To cover the costs of shipping we have to, unfortunately, charge a shipping fee. The amount of this fee depends on the country that you want to ship to. We also have free shipping from a minimum order amount which also depends on the country. 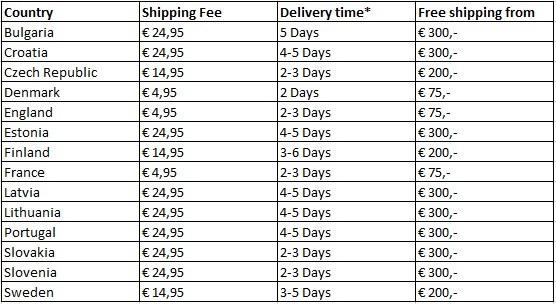 Please see the tabel below to find an overview of shipping fees, free shipping and delivery time. Due to a (partial) return it is possible that the remaining value of the order reached an amount lower than the minimum required order amount for free shipping. Because of this it is possible that the shipping fee is charged while this might not have been the case in the first place. Please note It is not possible to personally pick up your order. Your order will always be delivered to your home or if you want a replacing address or parcelshop of your choosing. Unfortunately we do not ship to some remote areas. If you live in one of these remote areas it is possible to place an order and ship it to an other address outside of these remote areas. Agradi has a very big assortment of products and due to this it is unfortunately not possible to always have every item in stock. If you order a product that we do not have in stock we have to order it at our supplier(s). As soon as we receive the products we will collect your order and send it to you as soon as possible. However because of this it is possible that some products have a longer delivery time than others. The delivery time is always shown on the product page. We have the product in stock and can be shipped directly. The actual time to delivery may vary based on complexity of the product and what payment method you use, but should take up to a maximum of four days. The product has to be ordered at our supplier and will be shipped within 5 days. After we shipped it you will receive a track and trace to follow your package. Here you can see the exact delivery time. The product has to be ordered at our supplier and can be delivered within 10 days. After we shipped it you will receive a track and trace to follow your package. Here you can see the exact delivery time. Our packages will only be shipped when all items of an order have arrived at our warehouse. Partial deliveries are possible only in absolute exceptions. To request a partial delivery please contact our customer service.